Done with 92% watercolor, 5% acrylic, and 3% colored lead...of some kind. This picture was 99% done last week, but I put off uploading it because LIFE and RESPONSIBILITY dictated that I do other things...like mow grass before it rained again. I tweaked it to be passable today, and decided to upload it. She does come up with good strategies. Great symbolism here, love her dress! Awesome!!! And I absolutely love the chess pieces - very clever!!! You know, I would have pegged Princess Pallas as the 'Princess of Strategy', and Princess Mercury as the 'Princess of Intellect', as Hermes/Mercury was the god of intellect, wit & cunning, and Athena "Pallas Athene"/Minerva was the goddess of war and wisdom. P.S. : Who do you have planned next in your "Princess of..." series? For the princess series, It looks like Princess Venus will be next (she's 79% done). Jupiter is sketched, so I'll probably start on her next or as Venus is drying. I may be MIA for awhile. I have....one...two... *counts on fingers* 4 non-sailormoon projects that need to be completed by the 16th of July (or earlier), and they are ALL large projects. One of them is 70% done, the other 3 I haven't started yet, so I'm going to be spending the next week or two (depends how fast I can make the paint fly) working on those projects. I wish you good luck & swift progress. How is Ninja Kitty & co.? Ninja kitty & co are well. Little Marble calico kitty hasnt been feeling the best (I'm not sure if she's having a period, or miscarrying), so I've been babying her, Ninja Kitty, and Ninja Kitties mom with canned cat food....which makes all of them happier. I hope she's feeling well soon. Over here, we've been enjoying lightning storms. Three in one day. (two thumbs-up). She is feeling better. But she's soo hungry for affection, that it can be kinda annoying. She even lets me carry her long distances (cuddles/pets) because she wants attention so bad. Marble is such a sweetie tho. Hope that Marble starts behaving soon. And we have had two more thunder/lightning storms, but I am still wishing for the ones back one Wednesday, they were epic. I'll keep thinking of ways to entertain the kitties. Maybe make catnip babies or something and see if it affects them. Do you get thunder/lightning storms in England often? 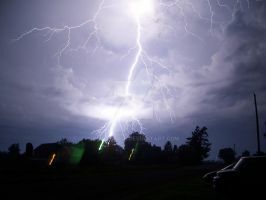 When traveled to Oregon about 10 years ago, they had a major electrical storm and my aunt/cousins were freaked out, because they normally do not have storms like that at their altitude (can be considered more dangerous because of the mountainous area). Actually a long time ago, I managed to snag an awesome picture of lightning (I've tried since then and none can match the beauty of this picture). How come she's not been sorted into a Gallery folder, yet? I havent been on my laptop computer for a couple of days, and I haven't figured out how to move thkngs via DA mobile app either. Eventually, get to moving her to a folder. Promise. Hows life going on your side of the globe? Not much, a bit of late spring cleaning, my older brother's birthday 2 weeks ago, Father's Day (I took my dad to see Jurassic World). Oooo! That sounds fuuun! I still have yet to see the movie. :< How was it? Excellent. And, they've left an opening for more hybrid dinos in any sequels. And I do wonder what as become of Site B since the events of Jurassic Park 3, too. Very clever idea with the chess pieces! I can recognize a good amount of them but do you mind sharing what/who all the pieces actually are? Weeeeeelll, the placement of the chess pieces could have been better thought out, but hey....hindsight is 20-20, I'll know for next time. I'm glad you like my ideas/concepts for this project. I really love this piece! A chessboard made of stars and the pieces look amazing! I just realized, the dresses on each of them have those pleats on the side, right? I'm glad you like it though! So, who do you have planned next? Phobos and Deimos are not kitties though. O.o why would they be with the kitty familiars? Because they are All Guardians/Parnters to real Sailor Senshi, bearers of Star Seeds that, though not in the Sailor Crystal class, approach that of Sailor Crystals in terms of power, and thus are assigned to certain Sailor Senshi (Luna = Sailor Moon/Princess Serenity, Diana = Sailor ChibiMoon/Princess Lady Serenity, the cute little un-named pink kitty = Parallel Sailor Moon/Parallel Princess Serenity, Artemis = Sailor Venus, Phobos & Deimos = Sailor Mars, etc.). Guardians/Parnters United, see? A group portrait for them all? And I suppose that you could always make your own OC Guardians/Parnters for other Senshi (i.e. a rooster for Sailor Mercury, an eagle for Sailor Jupiter, etc.)? And, of course, options from the planets' of Chū/Chuu, Mermaid, Cocoon, (since Coronis & Mau are already accounted for). See what I mean? Absolutely beautiful! I love what you did with the chess pieces. You're welcome! Yes they were a bit dark. Maybe something that could help with that is do them in a dark gray (for the parts that are darker) that way you can have the lines for the details in black. I know that's what some people do for their clothing HA's on another site I'm on.